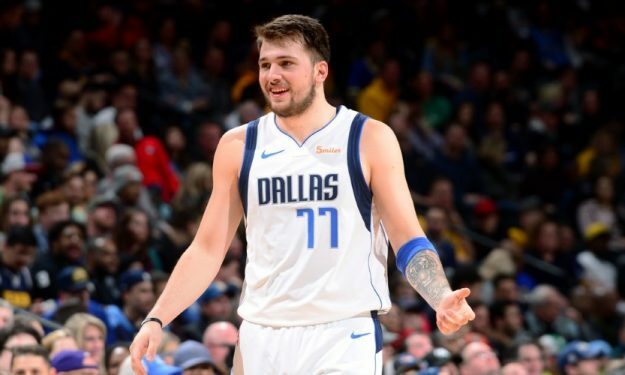 Luka Doncic never ceases to impress and he proved so once again with his Tuesday performance on Dirk’s special night. Luka Doncic recorded his eighth triple-double of the season on Tuesday with a performance of 21 points, 16 rebounds and 11 assists against the Suns. The Slovenian sensation moved up to the third position of most triple-doubles by a rookie, passing Magic Johnson, per Basketball-Reference. It was a special night overall for the Mavs in the last homecourt game of the season, since Dirk Nowitzki announced his official retirement after 21 seasons in the team. Dirk posted 30 points in his farewell game, leading Dallas to the victory. Charlotte Hornets Cleveland Cavaliers 124-97 Batum 3 p. – Osman 17 p. 4 r., Zizic 6 p. 4 r.
Memphis Grizzlies Detroit Pistons 93-100 Dorsey 12 p. 4 r. – Pachulia 3 p. 6 r.
Boston Celtics Washington Wizards 116-110 Theiss 2 p. 3 r. – Satoransky 19 p. 5 a.
Philadelphia 76ers Miami Heat 99-122 Marjanovic 12 p. 5 r., Korkmaz 2 p. – Gragic 6 p. 13 a.
Toronto Raptors Minnesota Timberwolves 120-100 Gasol 9 p. 6 r. – Saric 15 p. 9 r.
Golden State Warriors New Orleans Pelicans 112-103 Jerebko 7 p. 2 r.
Phoenix Suns Dallas Mavericks 109-120 Bender 12 p. 11 r. – Nowitzki 30 p. 8 r., Doncic 21 p. 16 r. 11 a., Kleber 4 p.
Denver Nuggets Utah Jazz 108-118 Jokic 2 p. 5 r. – Gobert 20 p. 10 r.
Houston Rockets Oklahoma City Thunder 111-112 Capela 18 p. 10 r. – Schroder 10 p. 5 r.
Portland Trail Blazers Los Angeles Lakers 104-101 Kanter 22 p. 16 r.